Check wnet.org for your local listings. Christmas Eve. New York City. A failed writer and a struggling actress meet while looking at the famous holiday windows and the windows come to life and look back at them! Including a lecherous elf with eyes for Mrs. Claus, an alien Scrooge arguing with an android Tiny Tim about reinterpreting classic Christmas stories, a pissed off Little Match Girl, Jim from The Gift of The Magi enjoying the fact that his newly shorn wife resembles a boy, a vapid Russian model trying to hook up with a snowman and a jealous Joseph The Carpenter, step-father of you-know-who … The Bats star in this sweet, smart and slightly twisted romantic comedy. The production stars Brett Aresco, Crystal Arnette, Allison Buck, Holly Chou, Jack Corcoran, Christian Adam Jacobs, Raúl Sigmund Julia, Betsy Lippitt, Turna Mete, Michael Micalizzi, Briana Pozner, and John Russo. The design team includes Kate Sinclair Foster (set), Jeanette Oi-Suk Yew (lighting), Gabriel Berry (costumes), and Jill BC DuBoff (sound). Steven Banks is the Emmy Award-nominated head writer of “SpongeBob Squarepants”. He recently co-created a full evening piece, Shadowland, for the renowned dance company Pilobolus. He wrote and starred in the critically acclaimed one-person play Home Entertainment Center on Showtime and performed it in Los Angeles and San Francisco, winning LA Weekly, Dramalouge and Bay Area Critic’s Circle Awards. Steven also wrote and starred in the national PBS series “The Steven Banks Show” and released a CD, “Songs from The Steven Banks Show”. His first novel, King of the Creeps, was published by Random House/Knopf. His play, Love Tapes, co-written with Penn Jillette, was nominated for three LA Weekly Theater Awards, winning Best Direction of a Comedy. He wrote the book and additional lyrics for the musical The Sponge Who Could Fly, currently touring internationally. Steven is a drop out of Los Angeles City College and a graduate of the Ringling Brother’s & Barnum and Bailey’s Clown College. 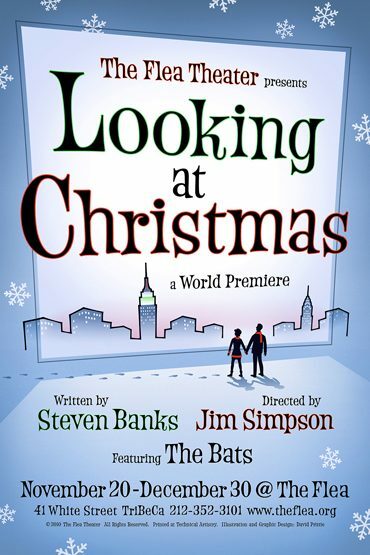 LOOKING AT CHRISTMAS runs November 20 – December 30. The playwright will give a Talk-Back after the show on December 28. Tickets are $25 and may be purchased by clicking the red TIX link above. Tickets may also be reserved by phone at 212-352-3101.